Whether you’re looking for a side dish that doesn’t require Thanksgiving Day oven space (and we all know that is at a premium!) or something to have in the fridge at the ready all week, this one’s for you! This hearty salad is super easy to whip up, festive and flavorful. 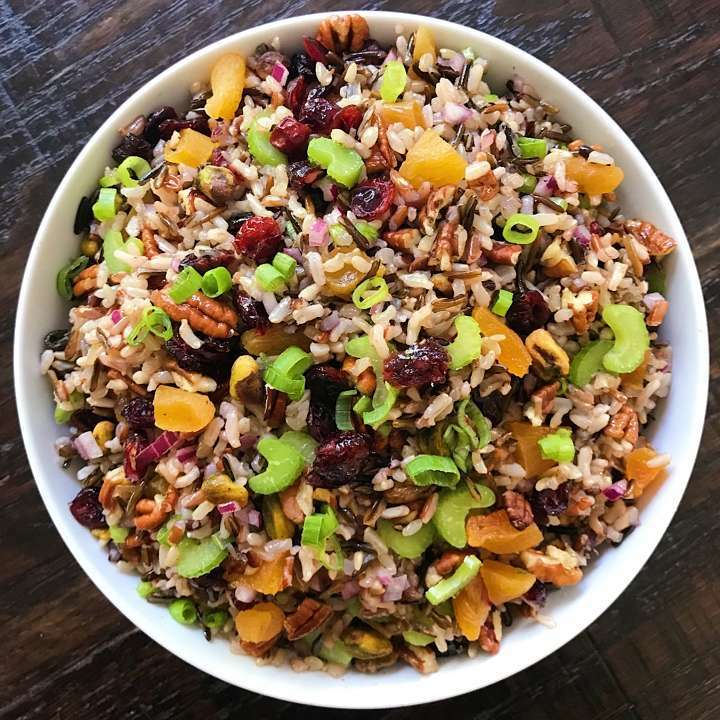 It’s simply wild rice + a ton of diced vegetables and dried fruit, all tossed in a lemon-honey-dijon -vinaigrette. It’s the type of salad that goes with everything. It’s packed with flavor but no one flavor is overpowering, so it’s satisfying and crowd pleasing. The details… Wild Rice, dried cranberries, pecans, roasted pistachios, dried apricots, celery, red onion and green onion all tossed with a Lemon Honey Dijon Vinaigrette. It’s savory, a touch sweet, a touch tangy, earthy and has just a bit of crunch. I made this salad for an early Thanksgiving dinner, and it was a hit! It’s super easy to throw together, and it’s a nice change from traditional side dishes that are heavy and carbs & fat. We took some leftovers home, and it was very tasty the next day. Defenitely keeping this recipe on hand for family gatherings or potlucks. This is one of those recipes that you can swap out ingredients with this seasons. So glad you love it too! It is so light and refreshing compared to traditional sides… and I agree, it’s one of those salads that will still taste great if you skip or substitute an ingredient! Thanks for sharing and Happy Thanksgiving!